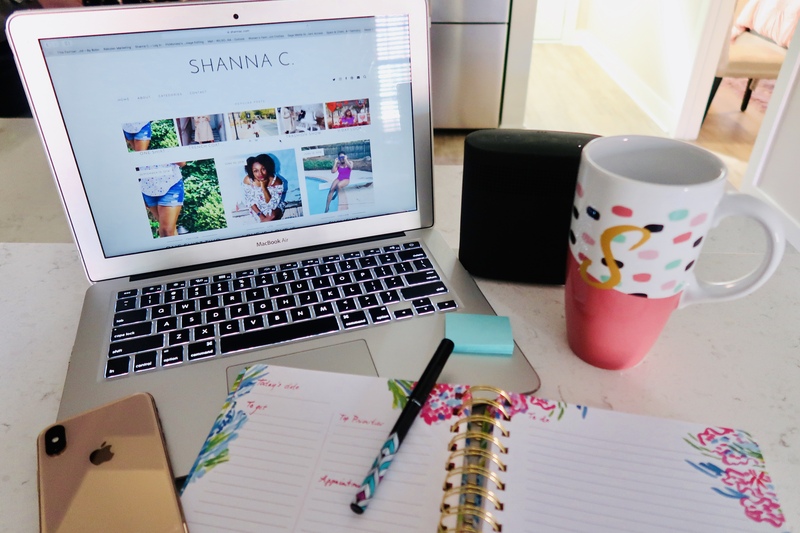 My Blogger Essentials – Shanna C.
My number one essential item for blogging is my MacBook Air. This laptop is functional and user-friendly. Whenever I am researching for a post and/or writing a post it’s in my lap. I almost feel a little ol’ school because I use my laptop and not my phone or iPad. It brings me comfort and I’m allowed to type with two hands instead of two fingers. This is always a plus because I can get more written quicker. My friend Microsoft Word also allows me to correct any grammatical errors. A laptop will always be my go to for blogging. My second favorite item for blogging is my music. I use my Bose speaker to deliver a crisp and clear sound. If you know me, I love Michael Jackson. When I listen to MJ on my BOSE sometimes I feel like as if I am at a live concert. This tiny speaker delivers big, bold sound that will satisfy anyone’s musical needs. It will definitely get you pumped for blogging. I love Lily Pulitzer and the planners the brand offers. I purchased this planner because it was a little different. I’ve learned that I am more of a to do list person. This planner is undated which I love because I can pick it up and use whenever I need to. It has two page spread. On the left page side of the page it has a space for the date at the top. Under the date, the page is divided down the middle. On the left side of the page it has a space titled “To Get”. In this section, you can list items you need to buy for the week. On the right side, the column is divided into two sections one for Top Priorities and the other section is for appointments. Now at the bottom of the page, there is a section called “Emails/Calls”, this to list any emails and/or calls that you need to make. Then the page to right is titled “To Do”, there is an entire page dedicated to listing anything you need to get done. The only reason I purchased this phone was for the camera. There are times when it is easier to snap a quality photo with an iPhone versus taking out a camera. The last iPhone I had did not have the portrait feature (which I desperately needed). With this feature I can take some amazing shots. I can adjust the aperture. I can also choose what light I want to use take my photos. Let’s talk blur…I can blur the background of a shot within a matter of seconds and it’s amazing. A needlepoint pen is a must have for me. The tip can’t be anything over 0.5mm. I love a fine tip writing utensil. The brand I prefer is pilot. This needlepoint pen, glides smoothly across the page without any hiccups. I use my pen to write down ideas for blogs, appointments, calls, and/or emails I need to make.